New math? Old math? Who cares? 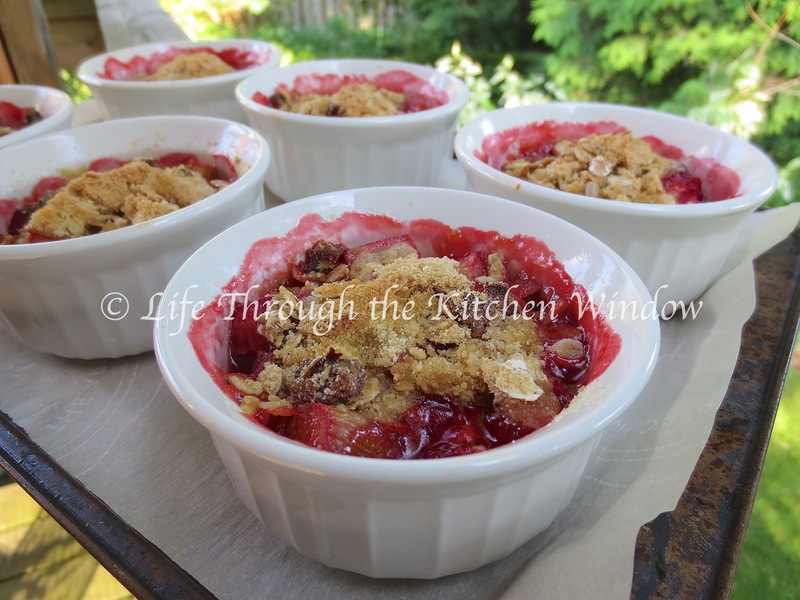 Pass the Sassy Rhubarb Strawberry Crisp! 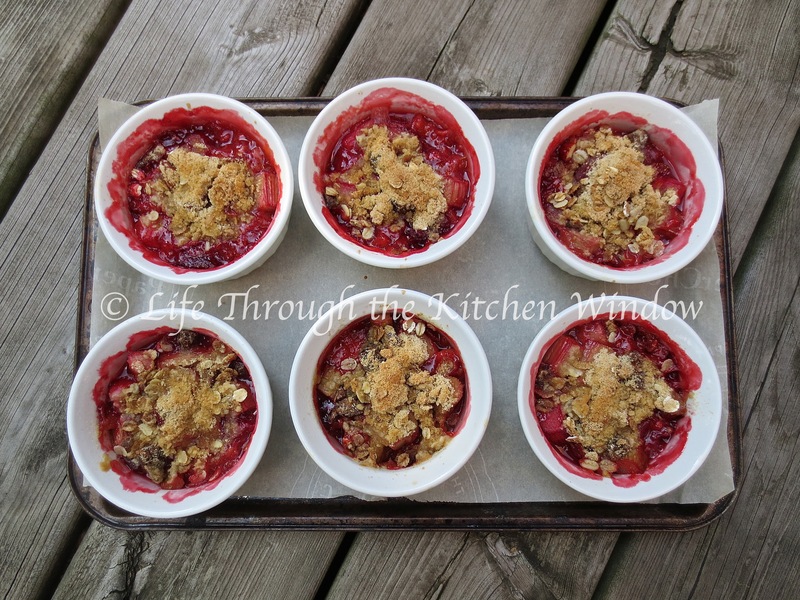 Not to criticize the ubiquitous strawberry rhubarb pie, but I wanted rhubarb’s tangy goodness to be the high note in this dish, hence its top billing in the title. The strawberries add swoonworthy sweet flavour and a striking deep pink hue. And as for pie, well, I like pie as much as the next person (possibly more), but pie means crust and for me, crust means rolling out dough. That’s fine when you have both time and inclination, but the day I made these crisps, I wanted more immediate — and easier — gratification. 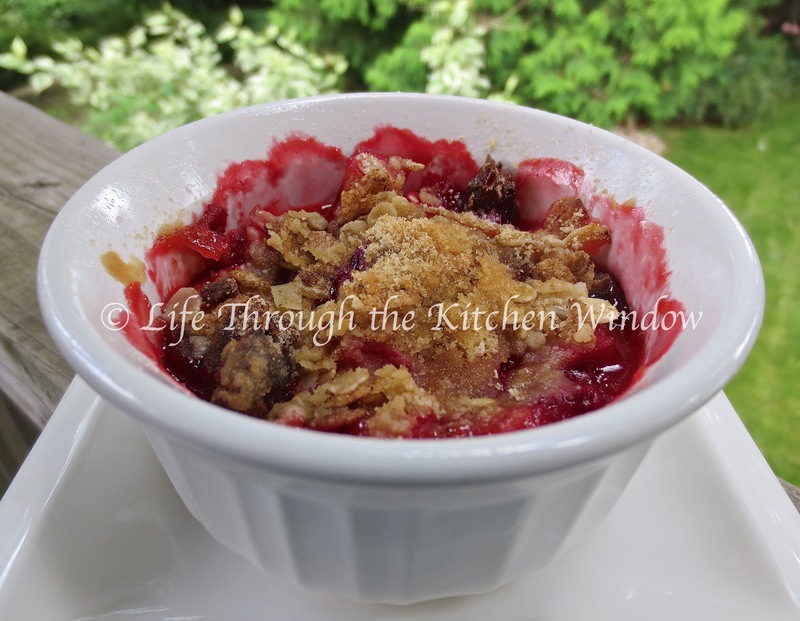 That’s where a crisp comes in, a carefree jumble of fruit, tossed with a bit of sugar and perhaps some additional flavourings and topped with a simple crumble. For a more special presentation, bake and serve in individual ramekins. A scoop of ice cream or dollop of whipped cream would be welcome, but if the Culinary Enthusiast’s reaction is any indication there’s no need for any embellishment. I’ve made more oatmeal-based crumbles than I can count, but if you have some quality muesli on hand do try using that instead to rev up your crumble. I’m one of ten food bloggers in Ontario participating in the Dorset Cereals® ‘blogathon.’ Before applying I checked out their products and was impressed by the quality and naturalness of their ingredients. Since then I’ve been working my way through seven (7!) boxes of muesli and granola (I know, it’s a hard life). I’ll be writing more about that shortly, but couldn’t resist sharing this recipe first. So let’s talk about that crumble. I didn’t want the sweetness of raisins competing with the fruits in the crisp, so I chose the Simply Nutty Muesli, a blend of multi-grain flakes with whole almonds, oat flakes, dates, Brazil nuts and sunflower seeds. Just imagine all that goodness combined with some brown sugar and butter. Oh my. Appealing colour, a tantalizing combination of tart and sweet, a hint of heat from ginger and the almost mysterious floral quality of orange zest, all topped with a rich, crunchy muesli crumble: there’s nothing old-fashioned about this sassy crisp. DISCLAIMER: The opinions about the product mentioned in this post are my own. Dorset Cereals® provided me the muesli used in this recipe in exchange for writing about their products on my blog. As a result of this arrangement I am eligible for a random draw for a $50 gift card. Pre-heat oven to 350ºF. Butter 6 ramekins and set on a parchment paper-lined baking tray to make clean-up easy just in case there’s any bubbling over. You could also make this in a single serving dish, in which case you may need to increase the cooking time by another 10 minutes or so. If you like a higher crumble-to-fruit ratio, by all means go ahead and make more. Serves six. Toss the rhubarb and strawberries in a large bowl. Add the sugar, ginger, orange zest, and orange juice. Sprinkle the flour across the surface. Stir with a large spoon until everything is evenly distributed. Spoon the luscious fruit filling into the prepared ramekins. I take no issue should you decide you pop a few pieces into your mouth. Combine the sugar, flour and ground ginger in a bowl. Cut in the cold butter with a pastry cutter or two knives until the butter is evenly distributed and the mixture is crumbly. Stir in the muesli. Using a tablespoon, top the fruit mixture in the ramekins. Being committed to fairness and equity as I am, I do my best to ensure each ramekin receives an equal allotment of this crunchy goodness. Bake for 35 minutes, or until the crumble is golden brown and there is hot pink volcanic bubbling action. Your photos make me want to grab a spoon and reach through the screen. Your crisp looks and sounds delicious. Hey Movita, so nice to hear from you! These crisps are a nice treat to celebrate your graduation! Biggest congrats, by the way. I can hardly wait to see what you’re up to next!